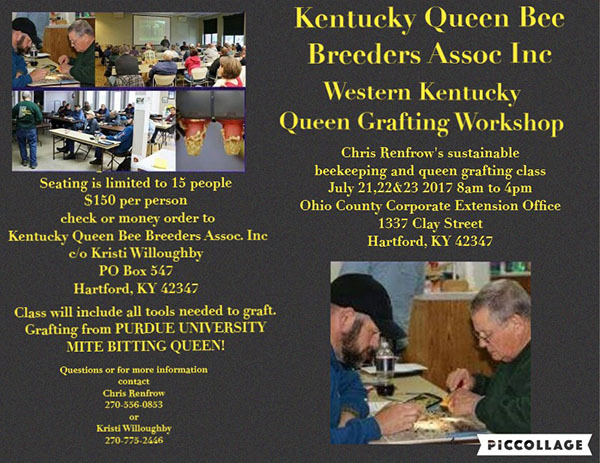 The Kentucky Queen Bee Breeders Association will host Chris Renfrow’s sustainable beekeeping and queen grafting class on July 21, 22, and 23. The class will occur from 8:00 – 4:00 CT at the Ohio County Extension Office (1337 Clay Street, Hartford, KY). Seating is limited to 15 people and the class costs $150 per person. All tools needed to graft will be provided. For more information or to register, contact Chris Renfrow (270-556-0853) or Kristi Willoughby (270-775-2446).